They sure will. Sendin big hugs and purrs. You've been in our thoughts so much, Melissa. We hope our virtual hugs and the love we send to you help to dry some of those tears. We'll miss your sweet Truffles. You're in my thoughts, Melissa. That hole is awfully huge right now, but we're sure Truffles will send another to help heal it when it's time. We are sure Truffles is watching over you and looking after you. I'm so sorry. It's never easy to say goodbye. Know that you'll see her again some day. You have been in my thoughts, and my heart breaks for you all over again every time I think of what you're going through. Be gentle with yourself during this difficult time. You're in our thoughts, and we're sure that Truffles is watching over you with the other kitty Angels. Much love XXOO. You've been in our thoughts all week, Melissa. Take all the time you need. There's no timeclock on how long it takes to feel not-so-lost. Grief is like a rock in a river. The edges do wear over time until they aren't as sharp. We're sending big purrs and lots of love in the meantime. Such a perfect quote to go with this beautiful graphic of Truffles. Sending you hugs. We've been thinking about you all the time and sending purrs and prayers. Truffles and Tara will life forever in your heart, and in the hearts of many. Beautiful, Melissa! Sending caring thoughts and love. Take care and take the time you need. Thinking of you. "No amount of time can erase the memory of a good cat, and no amount of masking tape can ever totally remove his fur from your couch." What a beautiful graphic of Truffles. I too found solace in writing, and I still do. As you know I still write about Abby and tomorrow I have another post for her. If that helps bring you comfort then do not hesitate to write it all out. The love you have equals to the grief you feel and it will take time to find your path along the way. Truffles will always be with you, as will Tara. And you will love another cat again.....Rocco and I just know it. Take care and Godspeed. There will be another one for you because there are so many that need you as much as you need them. Truffles was a sweetie and I'm very sorry she left you so soon. 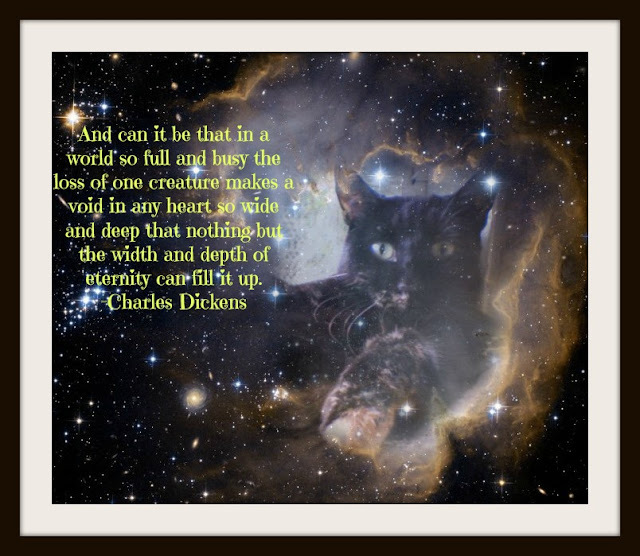 When I lost my big boy Panther to cancer, I could not even be in the same room with another cat without breaking into tears for months. Then one day a little black kitten was on my porch when I went outside. Panzer has been my friend ever since. When the time is right Truffles will give you a gift. We're so sorry that Truffles left for the Bridge too soon. The pain you are feeling can never erase the happy times with her and we know she's with you always. She will have a paw in the next kitty in your life. We're glad she'll still be a part of your blog. That'll be a lovely way to honor her memory. Oh Melissa, I am crying all over again. This was so beautiful, and for you to take the time to do this during your immense grief is just incredible. I will be sure to read what you find out about that horrendous disease. The graphic is just gorgeous, the poem, everything. I am certain when the time is right, Truffles (and Tara) will send you a most incredibly special kitty. Just like she was. I feel for you. I truly do. I have been through something similar with my Clara and its hard sometimes - really hard - but don't be afraid to blog about it! We're here for you. Oh Ms. Melissa weez sendin' you lots and lots of purrayers. We don't unnewstnad how this happened eever or why. Weez so luvved Truffles and we know how much she luvved you. Weez know she will send you a kitty to fill da hole in yous heart dat she left. There will never be anuvver Truffles fur you or fur us, but we will luv and suppowrt da luv she sends. Sending love your way. Truffles will truly be missed. I'd be interested in learning more about saddle thrombus. I remember a few kitties coming in for it before, but I don't remember much about it other than the outcome. Oh, my goodness! I've been out of town and am just now hearing the news. I (along with Storm and Dora) are so sorry for your loss and send you our prayers. We sure will miss Truffles. She left this world much too soon. We continue to send you comforting purrs, Miss Melissa. The picture and quote are beautiful. Truffles will live on in your heart forever, and she will always be there to watch over you. Little things will let you know she is close by and you will know she is there. Love and hugs to you. If something should happen to me, I'm sure my internet presence would come to a complete stop. We are so very sad about Truffles and especially sad for you. I absolutely know she is watching over you and I'm sure she will send you a new friend when the time is right. I know we are new followers so you didn't know my first dog Pip (who I started our blog with). He passed away in October 2013. He was truly my heart and I knew I couldn't blog without him. Although we have Ruby now, I still include Pip in the blog - kept the name and continue to post pictures of him with his "life lessons". It has been very healing for me to do this and a way to keep him alive in my heart. So, yes I say keep including Truffles in the blog if it feels right for you. Beautiful art of beautiful Truffles. You are in our thoughts. Sending you love and paw pats. Our hearts are still breaking for you and your loss. I have lost 6 dear pets over the years due to health problem is, but all were expected. I just can't imagine what a shock it was to have it happen so suddenly without any warning. It is going to take time...just one day at a time. Big hugs from M.
I have lost so many kitties over the years and it is so hard each time. My heart is aching with yours. Truffles was here for you for such a short time but she will be your angel watching over you from now on. I hope it does help to know so many of us know your pain. Thinking of you each day and hoping it gets easier as time goes on. We know Truffles is still watching out for you and always will. Our Angel Leo left us last summer and our Mama says she feels him with her every day on her bike rides. He looks out for her :) Be gentle with yourself Melissa. It will get less raw.Sending you our continued love. My Angel Admiral left me and I was so bereft and cried so hard and so much my shirts stayed wet in the front. There was no use in wiping my eyes so the tears just continued to fall. It has been three, going on four years and she chose Katie Isabella for me. She and I have a great love too but I will always miss my Tortie baby Admiral. She still has her blog and she posts from the Rainbow Bridge maybe once a month or so. Melissa, this was such a lovely tribute for Truffles and I'm glad she'll be continuing to have a presence here. Our friend, Debra from Manx Mnews has inspired many by blogging about her Angel Abby and hope she inspires you as well. Sending continued purrs of comfort. I hope you are doing better. The pain from this particular disease tends to stay with you cos you know how they suffered. We still thinking of you every day. Tara and Truffles will chose some cat for you to love and to fill your heart. TW isn’t sure that Nicky would have chosen me for her but here I am. Melissa, this is such a lovely tribute to Truffles. We are glad she'll continue on here, since we know that she will certainly always be with you, in your heart. Always. Thinking of you lots, and sending purrs, prayers and hugs. Yes, please, let Truffles speak again, the plans are in place, and she will watch with approval as we read her words and enjoy her beauty, when you feel ready to share them. Losing Truffles was a tragedy, and her being shared will be brave and kind. I still can't look at videos of Dash. You have my best love and all my tears. dash watched over me in my accident, Truffles watches over you now.